Invigorate your body with far-infrared radiation emitting from nature. Enjoy the wonders of hardwood charcoal kiln in the heart of the city of Seoul! Honoring the spirit of our traditional craftsmanship, Dragon Hill Spa has created a hardwood charcoal kiln made of red clay from deep forest of Muan, Jeolla Province that gets the most sunshine from the east. Red clay that has long absorbed and stored solar energy in large amount in its beehive-like structure slowly emits it as it is heated and is permeated into our body.. 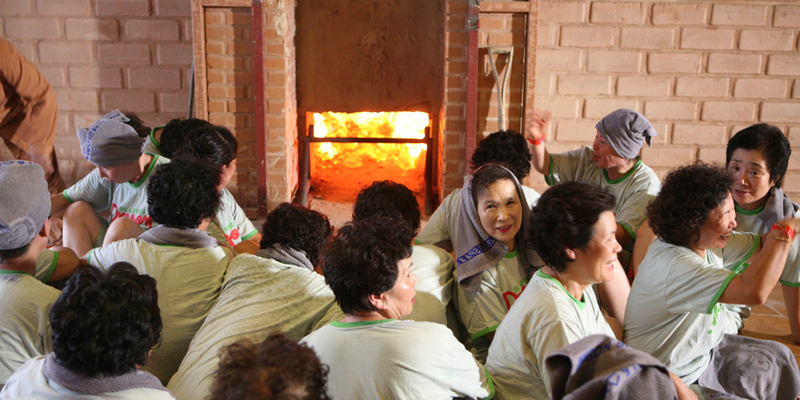 The heat energy of charcoal kiln relives people in modern days from long-accumulated stress and fatigue while the unlimited negative ions and far-infrared radiation are permeated deep into our body (4 to 5 cm deep) to facilitate blood circulation, metabolism and detoxification, providing effective treatment for people with modern-day diseases and fatigue. Hardwood charcoal kiln provides a variety of medicinal efficacies, including stroke prevention, skin care, anti-aging, fatigue recovery, relief of headache, backache, leukorrhea, neuralgia, and arthritis, boosting blood circulation and metabolism, hangover relief, constitutional improvement of atopic dermatitis, skin treatment and functional revitalization of cell. Take a shower before entering a kiln sauna. It is desirable not to take a shower immediately after sauna. ※ Sweating body of a person who just comes out of hot sauna engages in discharging bodily wastes with negative ions, scent of charcoal and pyroligneous liquid. If you take a shower during this process, you will lose the medicinal effect of negative ions and pyroligneous liquid. Therefore, it is recommended that you clean your body in at least three to four hours after hot sauna. Please note that the temperature inside the kiln is high enough to possibly deform metals and accessories such as glasses, earrings and watch. 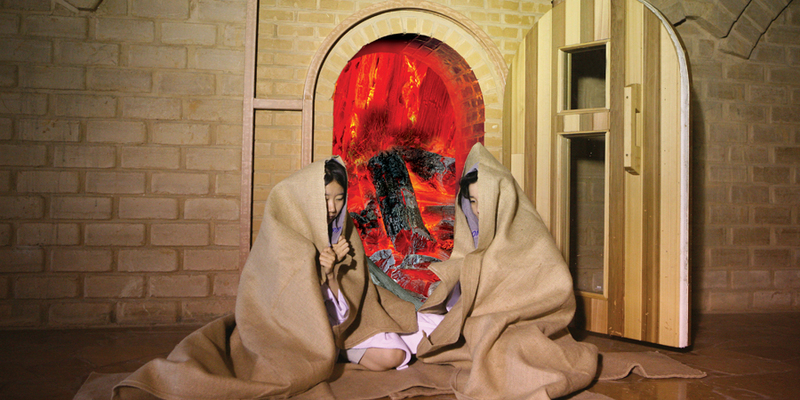 Flower Kiln (very hot): You will feel the heat you can’t stand for long. It is recommended to repeat the process of staying in this room for three to four minutes and of cooling for a minute or less (for about 10 times) ※ If you find the heat no longer hot enough, you are ready to move on to the next kiln. Hot Kiln: This is where you will start to sweat in earnest. You will find your body release sweat and body fluid if you stay for a certain period of time. If you feel body aches you should get close to the wall to get heat acupuncture or place your body near the top of the kiln. ※ The authentic hardwood charcoal kiln features hot air around the room instead of hot floor. Warm Kiln: This is where you want to be if you want to feel warmly relaxed while discharging bodily heat to some extent. 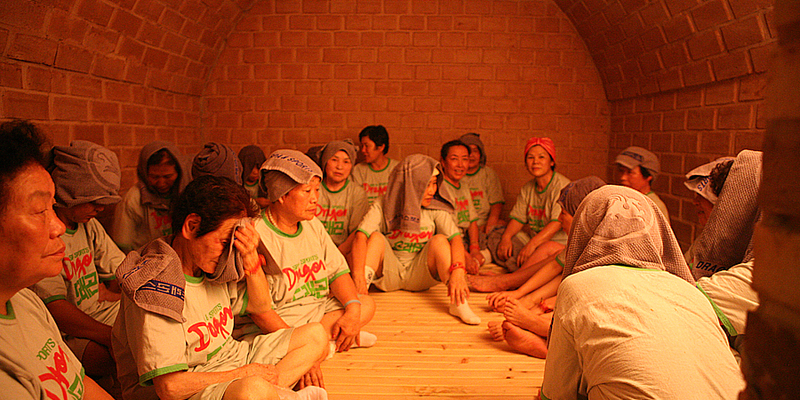 In general, this room feels slightly hot and is suitable for those who experience flower kiln and hot kiln to regain balance in the body. Tepid Kiln: This room feels like a cozy room warm enough to take a nap. This is the last stage of charcoal sauna where you will be able to regain your energy back. Patients may feel the following symptoms but do not have to worry about them because they are a part of healing process. If you feel these symptoms excessive, reduce the time and frequency of enjoying sauna and perspire as much as you can. If you feel the following symptoms, take plenty of nutrition and rest. The healing process may extend to the fourth phase for about three months, or absence of it or fifth phase or longer for those with diathesis.